Wow he sure is scary! Great job! Another "beauty". Great creation and a neat shot. You sure did a great job. Thanks Lilac, some turn out scary and some funny, they're all whimsical products of my warped imagination. Oh my, you sure carve well. And take good pictures, too! The lighting brightness and placement is just right to bring out the texture in the carving. Great! Thanks Carol, I guess 'beauty' really is in the eye of the beholder. Thanks Chuckster, key light from 30" softbox, a small gridded snoot, a white bounce card and ambient from window. Sorry 'bout the double post, doing this from a phone keypad. Ok, I guess everything with a face resembles somebody. Every now and then one of my carvings will look like a friend or relative, maybe a subconcience derivation. This is just magnificent, Larry! 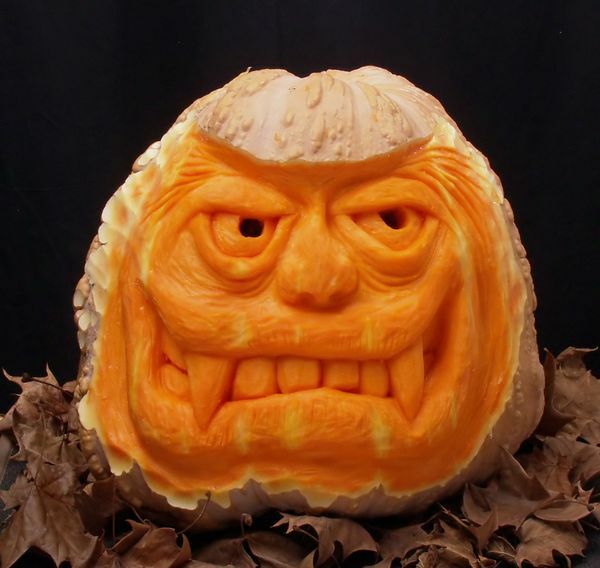 What fantastic carver you are! I looked that the others on your link, too; just fabulous!